The New York Times published a story today about gold mining conflicts in El Salvador titled First a Gold Rush, Then the Lawyers. The focus of the story is on Pacific Rim's attempts to open a gold mine in El Salvador, and is fairly sympathetic to the Canadian company. There is nothing in the article which will be new to regular readers of this blog, but it presents a broad overview of the gold mining issue. The continuing impact of higher international commodity prices has put the Funes administration under pressure to curb rising inflation, even as domestic demand remains weak. According to data from the Banco Central de Reserva de El Salvador (BCR, the Central Bank), annual inflation jumped to 6% in April, from 2.1% in late 2010, and -0.2% a year earlier, reflecting in part much higher petrol prices this year—in January-March oil imports increased by a sharp 40% year on year. Moreover, owing to a high dependence on imported grains and wheat, consumers have been badly affected by rising costs of imported food items. The website Socialbakers.com tracks Facebook usage across the globe. Their website now shows that El Salvador has surpassed one million Facebook users. That represents a penetration of some 16% of the Salvadoran population, and ranks El Salvador 74 out of 213 countries. Not surprisingly, 84% of the users are age 34 or under. Increasingly, Facebook is playing a role in Salvadoran politics and civil society. The protests against Decree 743 have a FaceBook page titled I Support the 4 Magistrates of the Constitutional Court. Politicians like President Mauricio Funes and San Salvador Mayor Norman Quijano have pages, as does the US Embassy. Inevitably, more and more organizing, debate, and campaigning will happen on Facebook and Twitter as the level of participation in these social media seems to have hit a critical mass. The plan calls for drafting 5,000 male teens deemed at risk of joining gangs and putting them through six months of civil defense training at centers run by the army reserve. Such service, officials say, would instill discipline in the youngsters while removing them from squalid conditions that have proved fertile for gang recruitment. The draftees, ages 16 to 18, would receive noncombat training only and would not handle firearms. 'Youths are going to be subjected to the rigors of military discipline, but will not receive military instruction like the use of arms, and only will be instructed in protecting of civilians who are vulnerable in cases of natural disasters,' said Defense Minister David Munguia Payes. The protests continue over the action of the Salvadoran National Assembly to try and change the rules to make it more difficult for the country's highest court to rule laws unconstitutional. The law, called Decree 743, would require a unanimous vote of the court's five judges to invalidate an unconstitutional law. The four judges responsible for the major rulings of the Constitutional Court ruled that Decree 743 was itself invalid and proceeded with only four votes to accept a suit involving presidential spending. The position of the judges sets up an institutional crisis with no particular way to solve it if the National Assembly and Funes do not back down. The Organization of American States is meeting in San Salvador from June 5 to June 7. The theme of the meeting is Citizen Security in the Americas. In the lead up to the meeting, there are a number of stories about drug-trafficking, violent crimes and gangs in Central America in the media. Earlier this month, Salvadoran President Mauricio Funes, in a plea for regional unity against the Mexican cartels, said the nations of Central America face a "very powerful enemy." He said the profits garnered by the drug smugglers exceed the resources "available to the security forces of our countries." 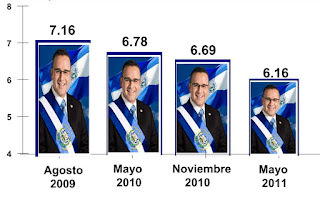 What I find most interesting is the almost identical pattern was experienced by El Salvador's last president, Tony Saca from the ARENA party. Saca started with a grade higher than 7.2 in UCA polling and was getting a grade of 6.2 on his second anniversary in June 2006. Salvadorans in 2006, as in 2011, reported crime and the economy as the biggest problems the country faced. In five years, the number of Salvadorans who feel the country is on the wrong track is still around 65%.